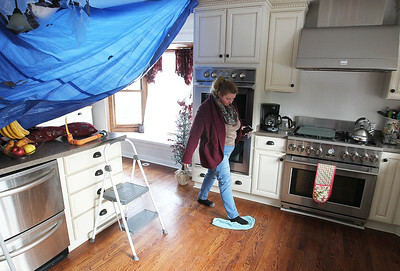 H. Rick Bamman - hbamman@shawmedia.com Groundhog Day House owner Lori Miarecki wipes up dripping water Wednesday, Jan. 3, 2018 in Woodstock after a sprinkler system pipe ruptured in the kitchen ceiling on Tuesday afternoon. Water gushed through the entire ceiling, lights, walls, and warping hardwood floors before flowing into the heating vents. The home was featured in the 1993 film "Groundhog Day," staring Bill Murry and Andie MacDowell. 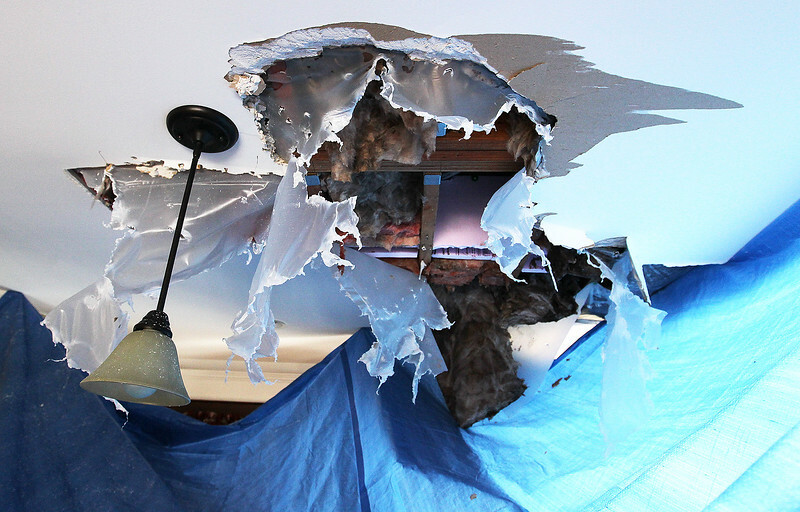 H. Rick Bamman - hbamman@shawmedia.com A gaping hole formed in the ceiling of the Groundhog Day House kitchen after a sprinkler system pipe ruptured on Tuesday afternoon in Woodstock. Water gushed into light fixtures, walls and warping hardwood floors before flowing into the heating vents. 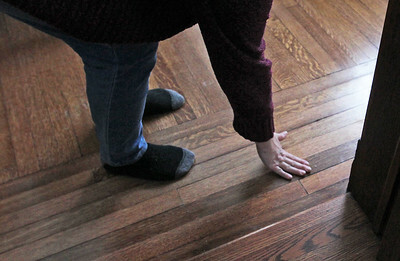 H. Rick Bamman - hbamman@shawmedia.com Lori Miarecki owner of the Groundhog Day House feels the warped dining room hardwood floor on Wednesday, Jan 3, 2018 after a sprinkler system pipe ruptured in the kitchen on Tuesday afternoon in Woodstock. Water gushed through the entire ceiling, lights, walls, before flowing into the heating vents which were still filled with water late Wednesday. A gaping hole formed in the ceiling of the Groundhog Day House kitchen after a sprinkler system pipe ruptured on Tuesday afternoon in Woodstock. Water gushed into light fixtures, walls and warping hardwood floors before flowing into the heating vents.